Escarole Soup is basically Italian Wedding Soup but without the mini meatballs. 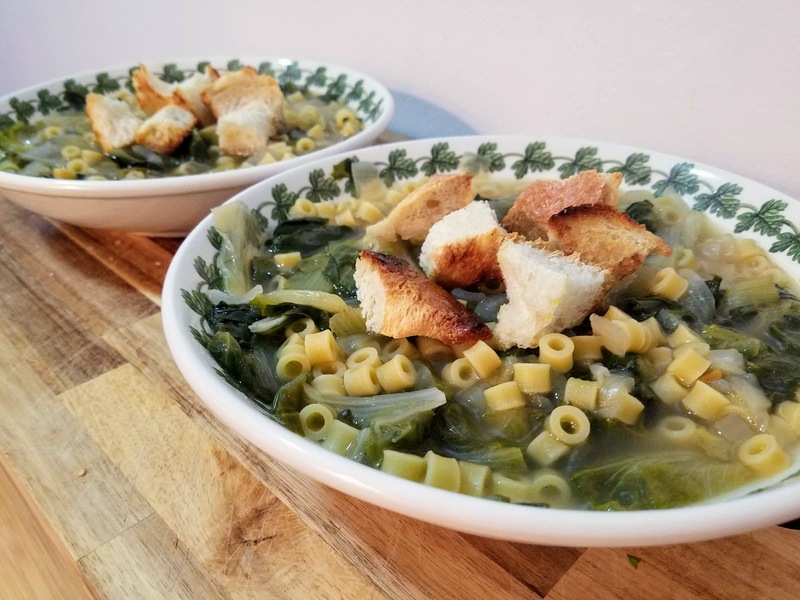 It's a very simple one-pot-meal, and only has three main elements that you basically can't mess up: escarole, broth, pasta. 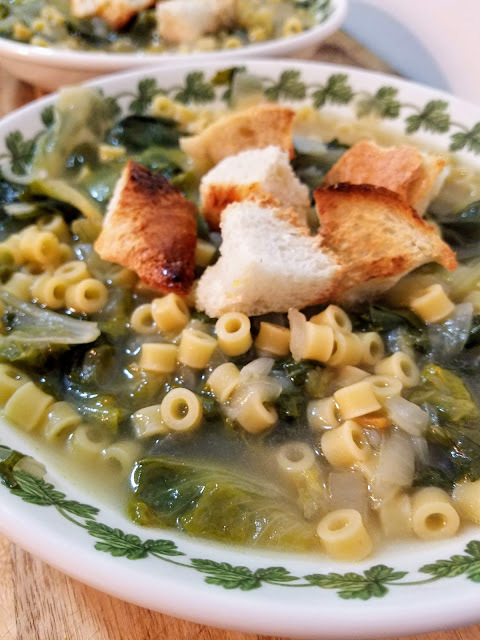 Throughout the cooking process, the broth gets enriched with all the wonderful nutrients and depth of flavor from the escarole. If you've never tried escarole before, it's a lovely dark leafy green that needs a good rinsing before being cooked to rid it of the sandy soil that is lodged between the leaves. Maybe that doesn't sell it very well, but trust me, it's a powerhouse green that doesn't get enough credit! 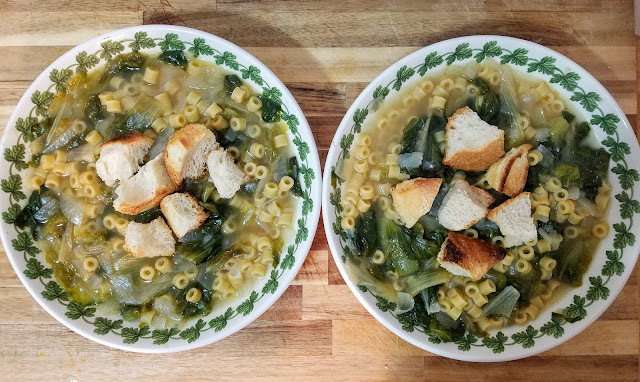 If you're a recent vegan, or a meat eater that's trying to eat more meatless meals, this soup should replace your chicken noodle soup as the meal that warms the soul, cures all ails, and revitalizes via the belly. Mangia! Slice rinsed escarole leaves into 1 inch strips. Let drain in a colander and set aside. In a large sauce pan or soup pot, melt butter over medium heat and add onions and garlic. Cook for about five minutes, stirring occasionally, until onions are golden brown. 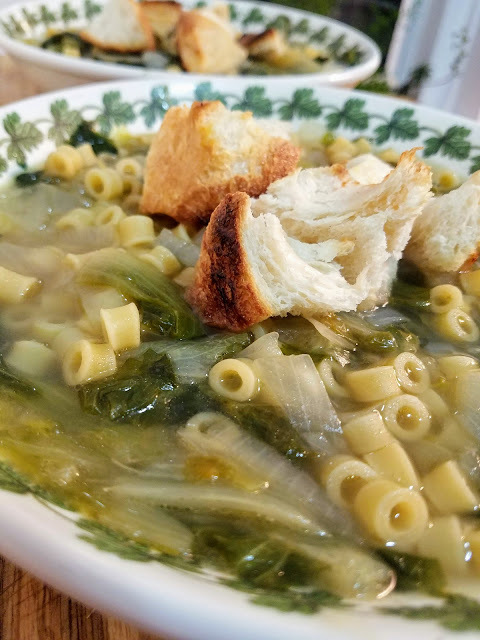 Add escarole and 1 cup broth, cover, and cook on low for about 15-20 minutes or until the escarole is wilted fully and a darker green color (this could take longer depending on the freshness of the escarole). Add the remaining broth and the pasta and bring to a simmer. 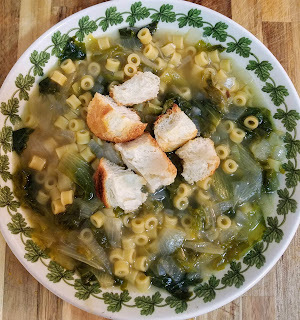 Let simmer for about 10 minutes or until pasta noodles are al dente. Remove from heat, season with salt and pepper to taste, and serve with croutons.